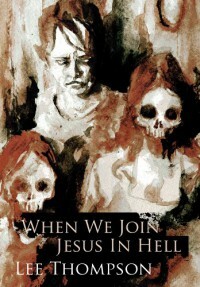 When We Join Jesus In Hell is an emotional punch to the stomach with a couple of knees to the face for good measure. The word 'Hell' is mentioned in the book's description a few times, and I like to think that that is exactly what this novella is. A sudden decent into grief, rage, vengeance, and then, finally, Hell. I don't want to go into the plot because it moves quickly and there are a few surprises along the way that will ruin it if I even begin with the set up. One thing I can tell you, however, is that the characters breath with life, the atmosphere is thick, and the prose is lyrical and full of symbolism. It's really quite a startling read that will draw you into its grim, darkly painted world. Once there, it will no let you go. When We Join Jesus In Hell will haunt you long after you've read it. I finished it almost a month before writing this review, and I still think about it. Highly recommended.